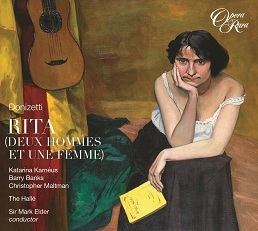 Opera Rara celebrates its 50th complete opera recording with the release of Donizetti’s Rita (Deux hommes et une femme). Conducted by Artistic Director Sir Mark Elder, Rita is the first studio recording of the newly restored critical edition of the score. 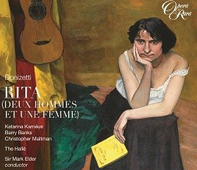 Opera Rara celebrates its 50th complete opera recording with the release of Donizetti’s Rita (Deux hommes et une femme) – in the original French. Conducted by Artistic Director Sir Mark Elder, Rita is the first studio recording of the newly restored critical edition of the score. Sir Mark Elder has recently been described as “a born-again Donizettian” by both The Sunday Times and BBC Music Magazine and the recording of Rita marks the sixth opera by Donizetti that Sir Mark has conducted with Opera Rara, as well as the first that Opera Rara will have made with the Hallé, of which Sir Mark is Music Director. The recording is sung in the original French, with Katarina Karnéus in the eponymous role of Rita, Barry Banks as Pepé and Christopher Maltman as Gasparo. Written in 1841, with a libretto by Gustave Vaëz who had co-written the French libretto for Lucia di Lammermoor, Rita was the only complete opera by Donizetti not to have been premièred in his lifetime. The one-act opéra-comique received its posthumous première at the Opéra Comique, Paris on 7 May 1860 where it had originally been scheduled over two decades earlier. Despite Donizetti’s efforts to have the libretto translated into Italian for the Teatro del Fondo in Naples, the untimely death of the Teatro’s impresario led to the performances being cancelled. The new edition on which the recording is based was created from Donizetti’s complete autograph score and a recently discovered manuscript libretto with autograph annotations. It restores the French spoken dialogue originally intended for the opera without the apocryphal additions which were introduced for its première in 1860. 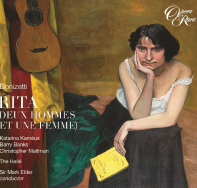 Donizetti’s works have been at the heart of Opera Rara’s repertoire since it was founded more than 40 years ago, and Rita is the 22nd complete opera by Donizetti to be released.